Enjoy the smooth, mellow taste of our Donut Shop Blend. It’s our lightest roast yet! Made with 100% Arabica Coffee. Gluten Free. Designed for use in your single cup brewer. Available in 12 and 32 Single Serve Cups Per Box. Please, consider this a full 5-star rating! The website will only let me select up to 4-stars. I really enjoy New England Coffee’s Donut Shop Blend and prefer it over several other breakfast, donut and light roast coffees. This refreshing coffee is perfect anytime! I also appreciate the unique, K-compatible packaging. I will order direct in the future as my local grocery no longer stocks this tasty blend. Cheers! Delicious. smooth and rich, but not strong…look forward to it every day at breakfast…. I appreciate the unique, K-compatible packaging. It is the best on the Market. loved that it is smooth and not strong. Yeah! So smooth and delicious. Good by itself and complemented well with any creamer. Not carried by my store any longer, which was a big disappointment. Excited to find out I can order directly from your website! This is my new everyday coffee. The taste and flavor I’ve been looking for. 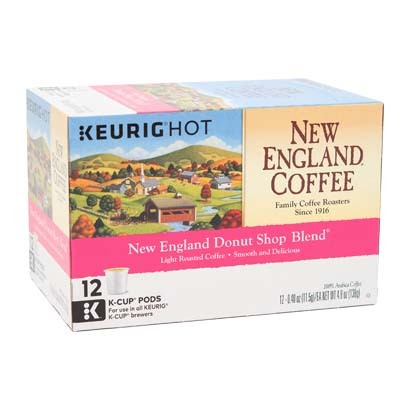 Goodbye Dunkin’ k-cups, hello New England Coffee!